Want to know all of the essential stuff you will need for cycling? Then read on as we explain the cycling gear and accessories required. Starting cycling to work isn’t all about buying the best bike. You also need to consider a few other cycling essentials that will make your ride to work easier, safer, and maybe even a little more fun. These are the basics that will cost very little but will make an enormous difference. First of all you will need something to wear on your cycle to work. Some people manage -especially on a short ride to the office – to wear their work clothes when cycling. However, this isn’t always the best idea as office clothes aren’t designed for cycling. Your work clothes will wear out quickly and you’ll get hot, cold or wet far too easily. There are three key items in every cyclist’s wardrobe: a pair of comfortable cycling shorts – which aren’t necessarily made from Lycra – a water and wind-proof jacket and a pair of waterproof trousers. A cycling jacket is essential to keep the wind off and help you stay warm and dry if there’s an unexpected shower. A jacket should be waterproof to a degree, wind-proof and breathable for when you start to work a bit harder. For more detailed advice, read our page on how to choose a cycling jacket. You might be surprised at how rare it is to get caught in heavy rain when cycling to work. However, when you do, you get wet fast. Having a pair of waterproof trousers for those miserable rainy days is a must. With a decent pair of waterproof cycling trousers and a good quality jacket you can stay warm and dry even in really wet conditions. For more advice, read our page on how to choose waterproof cycling trousers. The most important thing when cycling is to be comfortable and choosing a pair of shorts to cycle in is essential for a comfortable trip to work. For more advice, read our page on how to choose the best cycling shorts. 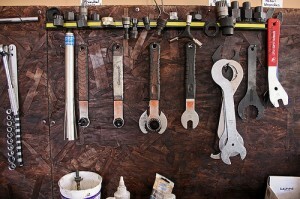 Whether you’re planning to do all your bicycle maintenance yourself (in which case, check out our selection of cycle maintenance videos), or taking it into the bike shop for most things, there are a few simple tasks that we can all learn. With tough modern tyres and inner tubes, punctures are nothing like as common these days, but fixing a puncture is still the most common cycling maintenance job. It might seem daunting and a bit technical to the inexperienced, but once you’ve fixed a puncture once you’ll see how easy it is. Keeping your bike’s tyres at the correct pressure is also a good way to make sure your ride to work is as comfortable and easy as possible. Likewise, regularly lubricating your bicycle’s chain and cogs will help your bike be as quiet and efficient as possible, as well as helping it last a long time. Carry a small portable bicycle pump with you when cycling, then if you get a slow puncture you can always pump a little more air in the tyres to get you home. Most models are small enough to fit easily in your bag or come with a bracket to attach it to your frame. Even if you don’t get a puncture, your tyres will gradually lose their pressure just through general riding. It’s essential to keep them pumped up properly, so that your ride to work is as comfortable and easy as possible. Flat tyres mean putting in a lot of extra effort! As well as a portable pump it is also worth investing in a track pump – a large floor standing model. While hand pumps are great for adding a bit of emergency air at the roadside, they are not really capable of getting your tyres to a very high pressure. This is especially important for road bikes with tyres that run at quite high pressures. You only have to buy a track pump once and they last for years. As well as a pump, you’ll need a puncture repair kit and some tyre levers. These will allow you to remove the tyre, locate the puncture and patch it up. Learn how to fix a puncture with this video. 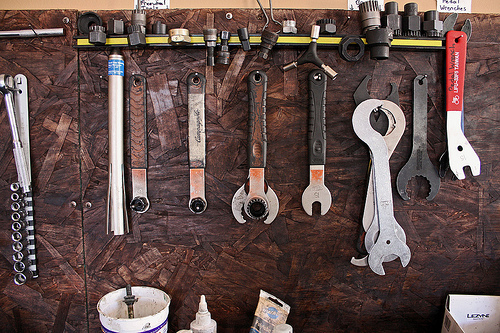 Keeping your bike well oiled will make sure that it runs quietly and smoothly, as well as ensuring that the chain and cogs are worn as little as possible. You’ll really notice the difference! Staying seen at night is very important, and a decent set of bike lights are a cyclist’s best friend. These days, LEDs lights provide bright illumination and a long battery life. These are great for areas with street lighting where you’re using your bicycle lights to alert others to your presence but in the country where you’re using them to see, you might need something with a bit more power. 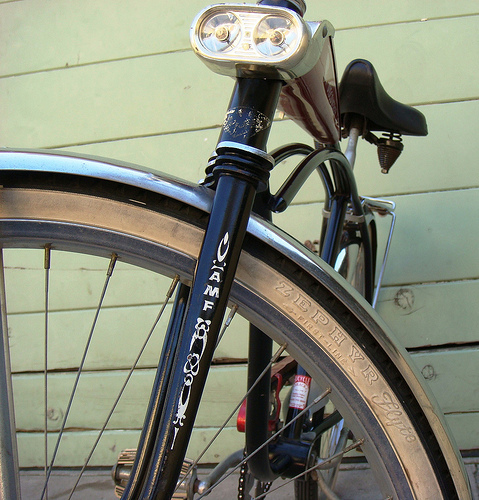 It can be a bit of a pain to keep taking your lights on and off your bike, so sometimes it’s best to go for something relatively cheap, so that you can leave them on your bike without worrying too much. Unfortunately, they do sometimes go missing. If you are cycling early in the morning or after the sun has gone down, it’s essential that you make yourself as visible as possible to drivers. It’s easy to blend into the surrounding if you are wearing dark colours, but a bright yellow jacket, vest or sash will make sure you catch drivers’ eyes. In 2011, more than half a million bikes were reported stolen in the UK but only 5% were successfully returned to their owners. 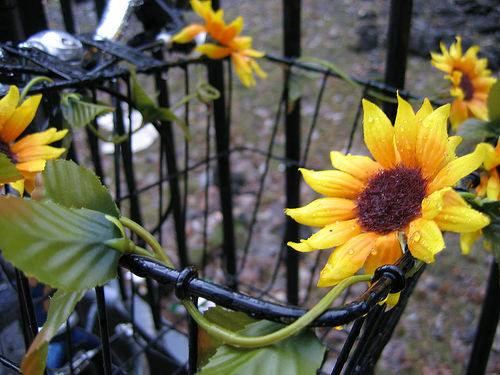 While nothing will guarantee your bike doesn’t get stolen, there are easy ways to put thieves off. Buy a good quality D-lock with a wheel loop to secure any wheels with quick release levers. Sadly there’s no way of ensuring your bike doesn’t get stolen. For complete piece of mind, it’s best to consider buying bicycle insurance. 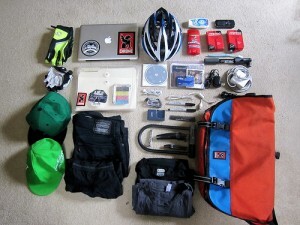 When you ride your bicycle to work, you will usually want to carry some things with you to the office. For more advice on bike baskets, panniers and courier bags, read our pages on how to carry your things to work.